Green Tea (The Natural Secret for a Healthier Life), Nadine Taylor, R.D. Add some excitement to your teas, and still benefit from their healthy properties. 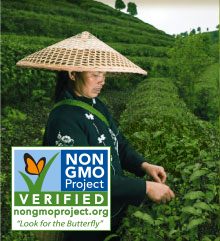 Make delicious new beverages by mixing Triple Leaf Tea's Green, Decaf Green, White, Cholesterid – Pu-erh or Oolong teas, herbal teas such as Ginger Tea and American Ginseng Tea or medicinal teas with other ingredients. Try adding fruit juices or cubed fruit, fresh mint, sparkling mineral water, ginger ale, or ginger and spices to your teas to make delicious hot or cold drinks. Your imagination is the limit! Enjoy these tea beverages every day. Please your family, friends and guests with your own creation of a special holiday tea beverage. 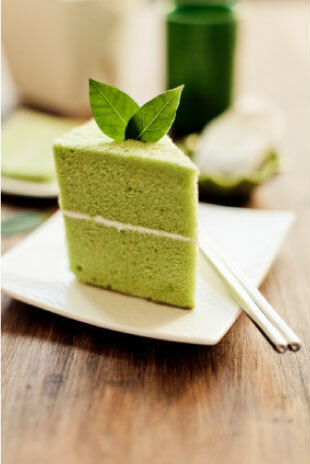 Green, white, oolong and black tea and ginger root are used in many main dishes, soups, desserts, and other delicious recipes. Cookbooks and internet searches yield a wealth of recipes and great ideas. See our listings below for more ideas, information and recipes. Pour one cup of boiling water over two tea bags, let steep for 3 to 5 minutes (5 to 10 minutes or longer for the Decaf Green Tea with Ginseng or Ginkgo & Decaf Green Tea to extract the full herbal benefits). For stronger flavor, steep longer, or use more tea bags. Remove and squeeze out tea bags. Add ice and enjoy. Make a larger quantity using more tea bags and water, and refrigerate the rest to drink throughout the day. 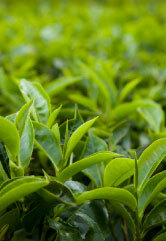 Make green or white tea concentrate ahead of time to prepare hot or iced tea at a moments notice. Pour one cup of boiling water over three tea bags, let steep for 3 to 5 minutes (5 to 10 minutes or longer for the Decaf Green Tea with Ginseng or Ginkgo & Decaf Green Tea). Remove and squeeze out the tea bags. Refrigerate until ready to use. Add 2/3 cup of water to every 1/3 cup of concentrate to reconstitute your tea; heat just until hot for hot tea, or add ice for iced tea. 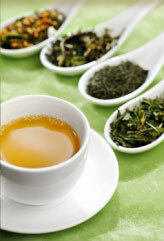 Use any Triple Leaf Green, Decaf Green or White Teas in recipes calling for green or white tea. You can experiment and see which one you like the best. Add a little prepared concentrated green or white tea to your fruit smoothie for an antioxidant boost. Pour 1/3 cup of boiling water over one tea bag, let steep for 3 to 5 minutes (5 to 10 minutes or longer for the Decaf Green Tea with Ginseng or Ginkgo & Decaf Green Tea blends), remove and squeeze out tea bag, let cool, and use in place of some of the liquid in your smoothie. Pour one cup of boiling water over two tea bags, let steep for 3 to 5 minutes. For stronger flavor, steep longer, or use more tea bags. Remove and squeeze out tea bags. Add ice and enjoy. Make a larger quantity using more tea bags and water, and refrigerate the rest to drink throughout the day. Make Cholesterid – Pu-erh or Oolong Tea concentrate ahead of time to prepare hot or iced tea at a moments notice. Pour one cup of boiling water over three tea bags, let steep for 3 to 5 minutes. Steep longer for a stronger flavor. Remove and squeeze out tea bags. Refrigerate until ready to use. Add 2/3 cup of water to every 1/3 cup of concentrate to reconstitute your tea; heat just until hot for hot tea, or add ice for iced tea. Brew a cup of very strong Triple Leaf Ginger Tea by adding two tea bags to one cup of boiling water and boil for a couple minutes. Let steep 5 to 10 minutes, or longer, then remove and squeeze out the tea bags, add some honey and stir. Add a little lemon juice, some sparkling mineral water and ice for a delightful beverage. Re-use the ginger tea bags for maximum benefit and to extract all of their spicy taste. Add a little prepared concentrated American Ginseng Tea to your fruit smoothie for an antioxidant boost. Add one tea bag to 1/3 cup of water and boil for a couple minutes. Let steep 5 to 10 minutes, or longer, then remove and squeeze out the tea bag, let cool, and use in place of some of the liquid in your smoothie. Re-use your ginseng tea bags to get the maximum benefit. Add a little prepared concentrated American Ginseng Tea to your vegetable juice (see Fruit Smoothie with Ginseng above). Try adding it to carrot juice, mixed vegetable juice, tomato juice, or other juice blends. Use ginseng the way that Chinese people do. Open a tea bag, remove the ginseng and add it to the pot while cooking chicken or vegetable soup for an extra health-supporting boost. Green Tea (The Natural Secret for a Healthier Life) by Nadine Taylor, M.S., R.D. This book takes an extensive look at the health supporting properties of green tea, and has many delicious recipes, too. On page 140, Nadine reviews Triple Leaf Tea's Green Teas. An excerpt follows: Green (Premium) Tea. Refreshing and bracing, this tea is the real thing just tea leaves, nothing added. The resultant brew is greenish-golden color with a satisfying, delicious, and mildly astringent taste. Jasmine Green Tea. This light and fragrant green tea really smells like flowers, and its yellow-green brew goes down smoothly without a hint of bitterness. Triple Leaf Tea's decaf green tea/tea blends and White Tea were not available at the time this book was written. They were not included in her review. Here are a few of the types of recipes you can find in this book. Hot Apple Tea, Moroccan Green Tea, Spiced Green Tea. Green Tea Ice Cream, Green Tea - Mango Sorbet.